Lionel Messi stole the show with two free-kick goals in a blistering display as Barcelona maintained their lead at the top of La Liga with a thumping 4-0 derby win over Catalan rivals Espanyol. The Argentine superstar curled hom two sensational set-pieces and set up another goal as he and his teammates romped to victory at the RCDE Stadium and made sure Barca kept chasing Atletico Madrid and Sevilla at bay. Atleti and Sevilla had moved level on 28 points with Barca on Saturday after Diego Simeone’s side defeated Alaves 3-0 and the Andalusians drew 1-1 at Valencia. However Messi made sure that Ernesto Valverde’s team kept their place at the top of the pile with a mesmerising display alongside front-three partners Luis Suarez and Ousmane Dembele that left Espanyol dead and buried by half-time. 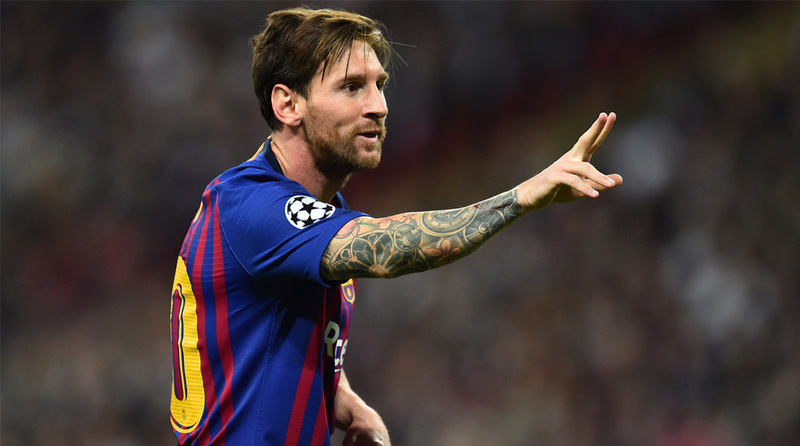 Messi began the rout in the 17th minute with a perfectly placed free-kick that arched past a desperate Diego Lopez, and followed that up by keeping possession under intense pressure before providing the pass for Dembele from which the French attacker curled in a fine second. It was then Dembele’s turn to become provider a minute before the break, slipping in a super through ball that Suarez somehow took on and squeezed home from near the byline. Messi capped a dominant team and individual display with his second free-kick of the night, which this time whipped past Lopez which such venom the Spanish goalkeeper could barely move towards it. Nikola Kalinic opened his league account for Atletico Madrid with the opener against Alaves earlier on Saturday, before Antoine Griezmann and midfielder Rodri sealed all three points at the Wanda Metropolitano with goals in the final 10 minutes. The only negative note for Simeone was World Cup winner Lucas Hernandez leaving the field with a knee injury in the first half. Mouctar Diakhaby’s header in second half stoppage time for Valencia meant Sevilla missed the opportunity to stay just a point behind Barca. Pablo Sarabia had put the visitors into the lead nine minutes into the second half and Sevilla had chances to seal the points at the Mestalla with Ever Banega and Andre Silva hitting the post.